JAKARTA, -- The Indonesian Marine Corps (Korps Marinir, or KORMAR) has conducted the first test firings of a newly acquired air-defence system from China North Industries (NORINCO), a source close to the service confirmed with IHS Jane's on 15 August. The tests, in which unmanned aerial vehicles (UAVs) were deployed as targets, were conducted at the Batu Bintang beach in the Sukabumi regency of West Java on 12 August. Present during the tests were technicians from NORINCO to train KORMAR personnel in the handling of the system. The set-up deployed comprises four units of the Type 90 twin 35 mm towed anti-aircraft gun system, one AF902 mobile air-defence fire-control radar system, and four mobile power supply units. The components, delivered by NORINCO in July 2016, were tested in automatic target acquisition and detection modes. 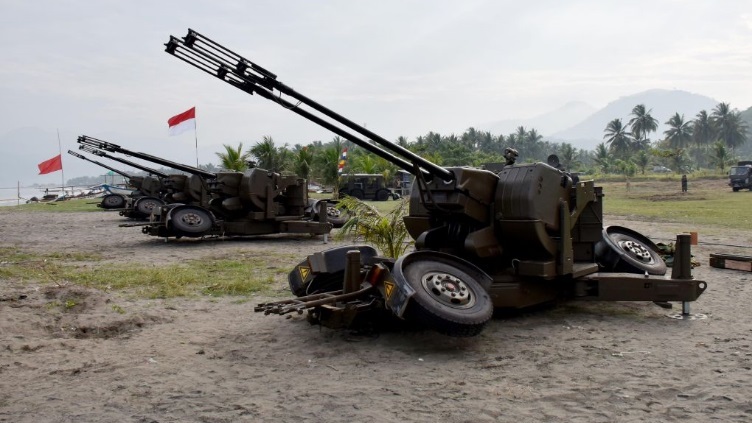 "The firings were conducted to demonstrate the capability of this anti-aircraft system that will be inducted with KORMAR's Second Air Defence Artillery Battalion", said the service's public affairs office in Sukabumi, in its statement on the tests. The Type 90 twin-barrelled 35 mm guns, part of the Indonesian Marines Corps' new air defence system from NORINCO, seen during its test firings in Sukabumi.